Like it or loathe it Twitter is mainstream. Yet while it may be one of the top 3 social media websites in the world, many people just don’t “get” it and until recently I counted myself as one of those. However, with a concerted effort over the last few months I have come to understand Twitter and have learned to love it. While I’ve had a Twitter account for a number of years, dabbling every now and then with a tentative tweet here or there, I never really “got” it. For some reason the penny just wouldn’t drop. At a recent meeting of my local social media club one member extolled the virtues of Twitter and how beneficial it was to her business. She had over 36,000 followers and swore by its power for lead generation and networking. Having heard first hand of Twitter’s power I decided to take action. Before our next meeting I was determined to “get” Twitter. After all, if the BBC and such highbrow programmes as their political “Question Time” used Twitter, then it was about time I “got” it. Twitter is described by some as a “micro-blogging” website, or “the SMS of the Internet” and allows you to send messages (Tweets) of up to 140 characters in real-time. These messages can embed links to other media, such as photos or videos, as well as linking to other websites. Twitter is used by a wide variety of people from the banal “I had toast this morning” crowd, to businesses seeking to connect with their customers through to journalists monitoring Twitter’s stream of consciousness for breaking stories. Like many things, with Twitter you get out what you put in and as up until recently I wasn’t putting very much in to it, I certainly wasn’t getting very much out of it. My first tweet was on 26 January 2008. It was not terribly inspiring or insightful, being simply: “Pootlinng”. Embarrassingly, I even spelt it wrong! While I continued to dabble with Twitter over the coming weeks and months, I never really clicked with it. In the end it took almost 5 years before I really came to terms with it. 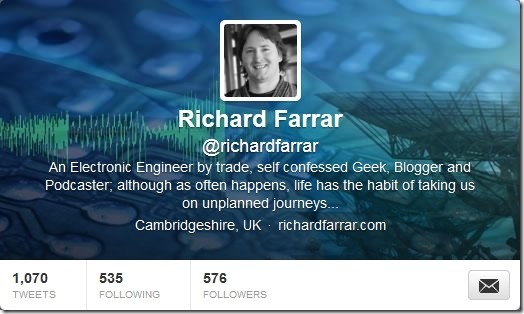 Having decided to give Twitter a really good go, my first task was to update my Twitter profile. I used the same branding background as my other social media profiles for consistency, and crafted my Twitter “bio” paragraph; introducing me to fellow twitterers and including the all important link to my blog. The Twitter profile is essentially your “sales pitch” and your one chance to capture a passer-by’s attention in an attempt to get them to connect with you. You only have one chance, so make your Twitter profile count! Whilst getting to know Twitter I’ve come to realize that it’s true power is in facilitating conversations and enabling you to engage with likeminded people. Over the past few months I’ve made a few really good connections via Twitter and have had some very useful conversations. By following interesting people I’ve also found some informative articles and fantastic resources on the web that I would never have found otherwise. If you intend to use Twitter purely as a broadcast mechanism, announcing to the world what you’ve just had for breakfast for example, then you’re probably not going to get terribly far (unless you’re already a celebrity). So, if Twitter isn’t just about broadcasting your breakfast menu, how should you use it? While Twitter can be used in many ways, there are some general dos and don’ts to consider regarding its use. It’s not rocket science. 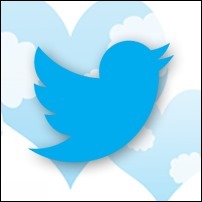 Tweet regularly, tweet interesting things, engage with others and share the love. There are many ways to tweet; from Twitter’s website, to mobile apps enabling you to tweet on the go, through to more sophisticated desktop social media management tools like Tweet Deck, Hoot Suite and Buzz Bundle. Delving into the relative pros and cons of these tools is beyond the scope of this post. However, if you’re just getting into Twitter then their own web interface is a pretty good starting point. At the top of Twitter’s webpage is a tool-bar that provides quick and easy access to a few of Twitter’s useful features. This is a quick place to check who’s followed you recently, what tweets have mentioned you (with the @ reference to your Twitter name) and tweets of yours that have been re-tweeted. This feature can also prove useful for tracking and responding to conversation threads. If someone follows you, and they look a genuine and interesting person, the general etiquette is to follow them back. Hashtags (#) combined with the search facility are a phenomenally powerful feature of Twitter and are heavily used by the twittering fraternity. Hashtags enable you to mark (tag) keywords or topics in a tweet that you or others can search on at a later date. They are very useful for categorising and finding tweets. For example, if you’re looking for information on podcasting, type #podcasting into the Twitter search box and you’ll be shown all the recent tweets about podcasting that used that particular hashtag. Another useful feature of Twitter is the ability to mark tweets as favourites, effectively bookmaking or saving them. Quite often tweets contain links to useful or interesting websites that you’d like to be able to refer to at a later date. With a single click you can bookmark a tweet for quick and easy access. Lists are a very powerful and much under utilized feature of Twitter. As Twitter etiquette seems to be “follow those who follow you”, you can quickly end up following masses of people resulting in a stream of tweets impossible to follow. Clearly you can’t follow everything everybody says and this is where lists can prove invaluable. 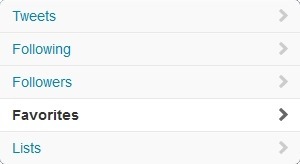 You can create lists (private or public) for specific topics of interest, assigning key twitterers to them as you go. 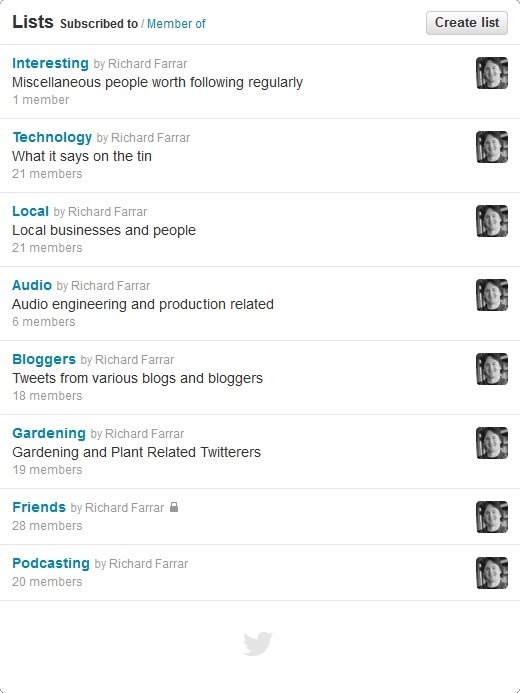 Once set-up you can quickly scan your lists to see what your close friends or colleagues are tweeting about. If you find anyone on your lists uninteresting, or perhaps clogging them up by tweeting too much, just remove them. After 5 years of floundering I finally “get” Twitter, but only because I made a concerted effort to use it regularly and explore it in more depth. Like many things in life, you only get back what you put in. Over the past few months I have made many connections with people on Twitter and have had some interesting conversations. By following select individuals more closely, and by using lists, I have discovered some fantastic articles and useful online resources that I would never have discovered otherwise. So, if you’re like I was and aren’t quite sure what this Twitter malarkey is all about, then I recommend diving in head first and immersing yourself in Twitter for a while, but make a real effort. If after a couple of weeks you still don’t get it, then what have you lost, nothing really, but if you do get it you could gain so much more. Enjoy the journey and why not connect with me on Twitter @richardfarrar? Great post Richard – thanks. I’m exactly where you were before diving in and am ready to take your advice. I have a newish podcast that has (I think) world wide appeal and feel twitter could be the perfect way to get word out. Good luck with the Twitter thing and please feel free to connect with me if you like @richardfarrar. If you’re into podcasting, twitter can be a great place, you might also find some of my past articles on podcasting useful. 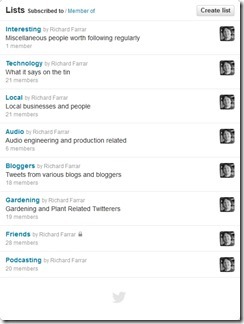 There are also some good groups about podcasting to follow on Google+. Hope to catch up with you online and please send me a link to your podcast.